Goodman Vending and Food Service is family-owned company that takes great pride in supporting our team members and the communities we serve. To that extent, we are very active in community events, client events and company events. We are delighted to share industry and community news because communications benefit everyone. You may also wish to view our Newsletter and past archives. HUG A VENDING MACHINE WEEK !!!!!! Check newsletters for winners! RV Goodman Vending, excellent service for 65 years Provided by RV Goodman Vending Updated: 02/22/2013 09:40:22 PM EST In one way, shape or form, RV Goodman Vending has been servicing the vending and food-service needs of clients in the Lebanon Valley and beyond for more than 65 years. RV Goodman is a product of Goodman Vending, which was founded in 1946 in Lebanon, and R&V Vending, which was founded a few years later in Myerstown. Today, RV Goodman-Lebanon, and its sister company, Goodman Vending-Reading, employ more than 80 people, provide services to over 300 vending clients and 800 coffee-service accounts, in a 10-county area of Pennsylvania. Together, they service more than 3,000 vending machines and are one of the largest and most prestigious independently owned vending companies in the eastern United States. The companies provide full-line vending service, including cold drinks, hot beverages, snacks, ice cream, dairy, and fresh and frozen food-vending machines. They also provide full-service cafeterias, mostly offering breakfast and lunchtime services. They also feature their coffee-delivery company, Café To You, which provides coffee equipment along with all types of gourmet and flavored coffees and teas, cappuccino, espresso and more. Of course, you can also get all the cream, sugar, cups and whatever else you need from the friendly Café' To You staff. Goodman Vending was the first vending company in the world to be approved as a Heart Smart Restaurant by Heart Smart International. Goodman Vending is also committed to constantly offering healthy snacking alternatives. Goodman was founded in 1946 in Lebanon by Ervin Goodman. Two years later in 1948, Erv hired Bill Buckholz as his very first employee. Bill's starting wage was $25 per week and all the candy he could eat. The company eventually expanded into Reading. Bill eventually bought the company in 1982. Bill's son, Tony, started working at the company at the age of 13 in 1980. Tony's first jobs were polishing trucks and mopping floors. Tony graduated from Albright College in 1989. These days, Tony is the principal owner of Goodman and RV Goodman Vending, and serves as the president and CEO of both companies. Bill is still very active in the operations and serves at the chairman of the board, as well as the chief operations officer. In 1999, Rich Croft was named general manager of RV Goodman in Lebanon. In 2013, Rich will be celebrating his 46th year in the vending industry. To that, Bill Buckholz said, "Keep going, Rich. I'm at 64-plus years!" Tony had no comment since he is the least experienced at 32 years. RV Goodman's plans for 2013 include focusing on client retention, building its customer base, adding even more health-conscious selections to their menu, and continuing to bring fun into their customers' break rooms via excellent service and communication, as well as expanding their special programs and promotions. 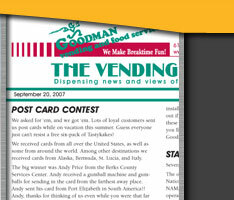 -------- The information in this story was submitted by RV Goodman Vending.